Discussion in 'Extensions (Userscripts)' started by Boo Berry, Mar 30, 2014. In this topic I'd like to keep track of userscripts found to not be working through Adguard, while working fine in Greasemonkey/Tampermonkey. This list shall be used for the developers to track broken scripts. If any members find anymore broken userscripts, please post about them here and I'll try verifying the issue(s) and adding them to the list above! AdsFight works for me. I tested it on Forbes, usually it redirects to a blank page, used to be an ad, and AdsFight makes it go to the article. Whoops... Sorry, didn't read well enough. ADBypasser also doesn't work !! 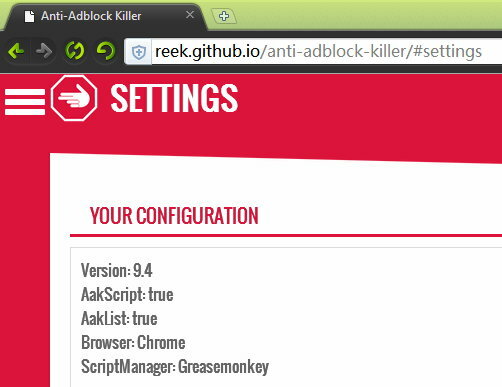 Does the Anti-Adblock Killer userscript work? I did notice when trying to access the script's Settings website it wasn't detected as installed. Odd, it doesn't work for me at all. EDIT: Works in Firefox though, not Chrome. Going to dig deeper. Okay, now it works. Caching issue - anyone who installs it should clear the browser's cache before trying to access the script's settings.